Anyone questioning the vitality of progressive media in the United States needs to check out The Young Turks. This online video channel claims 80 million unique views a month. This puts it in the same league as The New York Times and The Washington Post. This article is part of a special issue of The Nation on “Media in the Trump Era,” available online in full here. 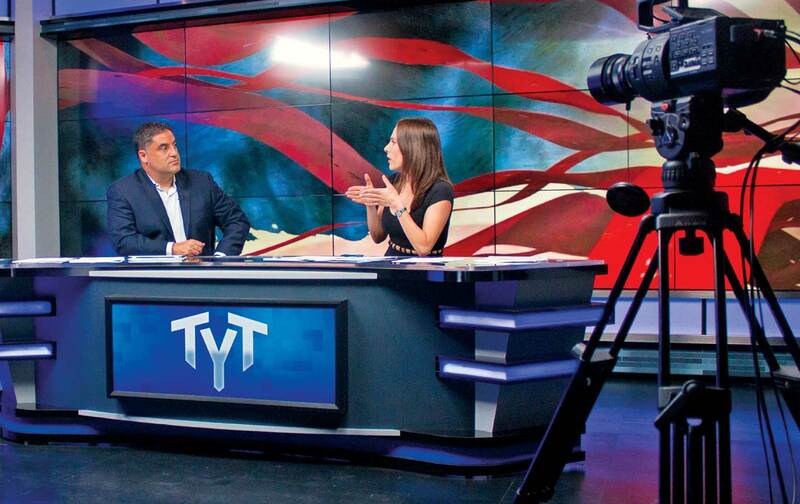 Founder and host Cenk Uygur launched The Young Turks as a radio show in 2002 before taking it online in 2006. He joined MSNBC as a contributor in 2010, but left the network a year later over editorial differences. (See Mark Hertsgaard’s article in this issue for Uygur’s version of his clash with the corporate bosses at NBC.) Currently, The Young Turks streams live for two hours every Monday through Friday, starting at 6 pm Eastern time, and is hosted by Uygur and Ana Kasparian. Laura Flanders interviewed Kasparian and the channel’s chief business officer, Steven Oh, about the secrets of their success—and why they banned coverage of Donald Trump for a time from the show. This interview has been edited for space and clarity. Laura Flanders: Ana, what makes a Young Turk? Ana Kasparian: Someone who is opinionated, strong, passionate, and doesn’t worry about censoring him- or herself. Flanders: Am I correct in thinking that Donald Trump is one of two people you’ve ever banned? Oh: No, because that’s exactly what we don’t want to reward—people who say ridiculous, over-the-top things just to get more attention. We banned Ann Coulter and Donald Trump because we didn’t believe that they were honest about anything they were saying. But we couldn’t ban him forever, because he was going to become president; he was winning the Republican primary, so we had to rescind the ban. We covered him, but we tried to cover him in a way that didn’t cater to his particular needs. Flanders: On election night, The Huffington Post, Nate Silver’s FiveThirtyEight, Steven here—lots of progressives—were confident Hillary Clinton was going to win. Flanders: How are you processing that fail with your audience? Kasparian: Honestly, I think that the pollsters, the establishment media, a lot of liberals—including ourselves—unfortunately kind of fell into this bubble, and this belief, that someone as hideous as Donald Trump could never win… even if Hillary Clinton was a flawed candidate, even if she didn’t really represent progressive values. I think that we really discounted the number of people who were disillusioned with the way politics were going. Conservatives give us a lot of heat for being elitist, but I now understand what they meant when they said that. We look at individuals who would vote for Donald Trump as if… we kind of undervalue them. And we underestimated them. Kasparian: I think that there is an interesting double standard happening with conservatives versus progressives: They say some of the craziest things, and they don’t get heat for it. That helped [Trump], because individuals felt like he wasn’t politically correct and he told it like it is. I don’t regret what I said. I think that members of the [Republican] Party have shown women time and time again that they see women as second-class citizens. I think that voting for a party that has those beliefs is voting against your best interest. I’m not going to tone down my rhetoric, and I’m not going to censor myself in sharing what I believe to be the truth. People could either love that or hate that, but I’m not really interested in playing games in order to appeal to a broader audience. Flanders: Does your business model depend on going outside the pool of supporters that you have now, Steve? Oh: Our business model is the audience first. That’s gotten us in trouble with advertisers, because sometimes our hosts say things that are not advertiser-friendly. That’s OK, and we have a spectrum of views. I don’t want to ever tell someone to tone it down. All I ask is that they actually believe what they’re saying… that they’re not saying it just for attention or whatever, that they actually believe it. Flanders: What is your budget, and how do you meet it? Oh: Our budget is roughly $1 million a month. It’s covered by a number of revenue streams, one of which is advertising revenue from YouTube, Facebook, Hulu, Pluto, Twitter, Amazon, and these other platforms…. Another big part is our subscribers. We have people who pay $10 a month to subscribe to our content, and sometimes they pay more than $10 a month because they just feel so connected to who we are and what we do. If you want to watch the whole show whenever you want, ad-free, at your convenience, there’s really no way to do that unless you’re a member. Flanders: You’re in town for an investor meeting. Have you always had investors? Oh: We’re at an inflection point. The current business model in news on television is geared toward servicing insiders of Washington, DC, and New York City. We’ve always been of the mind that we should serve outsiders, the masses, the people who really care about these issues. We want to do that on a global scale. I am taking meetings with investors to get money. It’s very important that we meet with the right investors, who are going to always allow us the freedom to do what we’ve always done. Flanders: Ana, what do you see as your mission at this point? Kasparian: To empower people and mobilize people to resist some of the policies and executive actions that Donald Trump will push forward… and to ensure that the Democratic Party doesn’t play the same games they played during this last election.